By “the Gospel of Nicodemus”, I mean not the apocryphal gospel of that title, but the passage of St John’s Gospel in which Christ speaks to Nicodemus, chapter 3, verses 1-21. This passage has an interesting and complex history among the readings of the Easter season. For liturgical use, the Roman Rite divides it into two parts, the second of which begins at one of the most famous verses in all the Gospels, John 3, 16, “For God so loved the world that He sent His only Son …”; the first part anciently included verse 16, but was later cut back to end at 15. 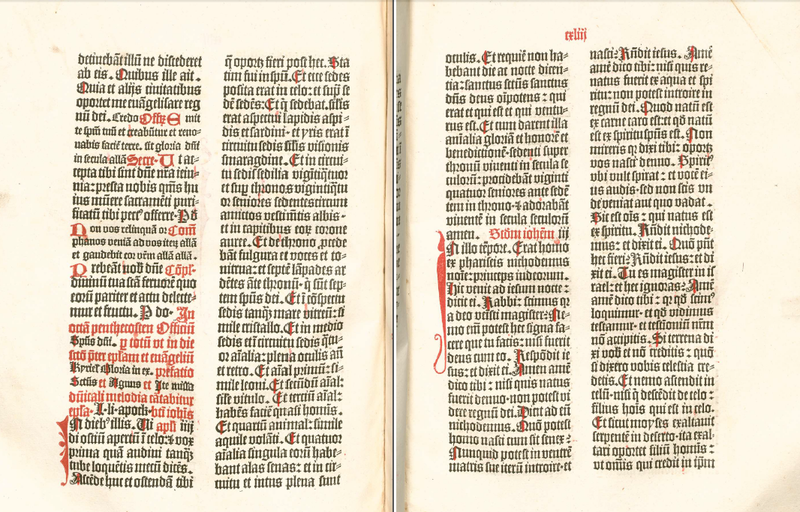 The oldest surviving Roman lectionary, the “Comes Romanus” of Wurzburg, was written around 700 A.D, and represents the liturgy of approximately 50-100 years earlier, the period just after St Gregory the Great; in it, John 3, 1-16 is assigned to be read twice in Eastertide. The first occasion is on the Pascha annotinum, the anniversary of the previous year’s Easter and baptism of the catechumens. The second is the Octave Day of Pentecost, the observance of which is, of course, much older than the feast of the Holy Trinity which we now keep on that Sunday. Augustine then says (11.4), “Let us ask (the catechumen), ‘Do you eat the flesh of the Son of man, and drink (His) blood?’ He does not know what we are saying, because Jesus has not entrusted Himself to him.” The fact that Nicodemus first came to Christ at night (John 3, 2) also refers to his status as a catechumen. “Those who are born from water and the Spirit (John 3, 5), what do they hear from the Apostle? ‘For you were heretofore darkness, but now light in the Lord. Walk then as children of the light.’ (Eph. 5, 8) and again, ‘Let us who are of the day be sober.’ (1 Thess. 5, 8) Those then who have been reborn, were of the night, and are of the day; they were darkness, and are light. Jesus already entrusts Himself to them, and they do not come to Jesus at night as Nicodemus did…”. Following this interpretation, the Gospel is perfectly suited for the celebration of the Pascha annotinum, in which the catechumens commemorated the day when Christ first entrusted Himself to them in both Baptism and the Eucharist. On the Octave Day of Pentecost, this Gospel is repeated, although the Wurzburg manuscript here attests to a custom of the Roman Rite observed in northern Europe, but not in Rome itself. Already in very ancient times, baptisms were done on Pentecost as on Easter; this is attested in a letter of Pope St Siricius (384-399) to Himerius, bishop of Tarragon in Spain (cap. 2), and one of Pope St Leo the Great (440-461), in which he exhorts the bishops of Sicily to follow the Church’s custom and the example of the Apostle Peter, who baptized three thousand persons on Pentecost day. (Epist. 16) The Gospel of the vigil of Pentecost, John 14, 15-21, is continued on the feast itself with verses 23-31, both passages referring to the sending of the Holy Spirit. Since Baptism was traditionally administered on Pentecost, the reading of the Nicodemus Gospel on the Octave, a foundational text for the Church’s understanding of that Sacrament, expresses what an important aspect of the feast this really was. On Easter itself, the Gospel of the Mass “for the baptized” is John 7, 37-39. However, the words noted here in brackets are omitted at this Mass. Pentecost also has two Masses, and at its Mass “for the baptized”, this Gospel is repeated, but including the final words, further emphasizing the connection between the two great baptismal feasts. 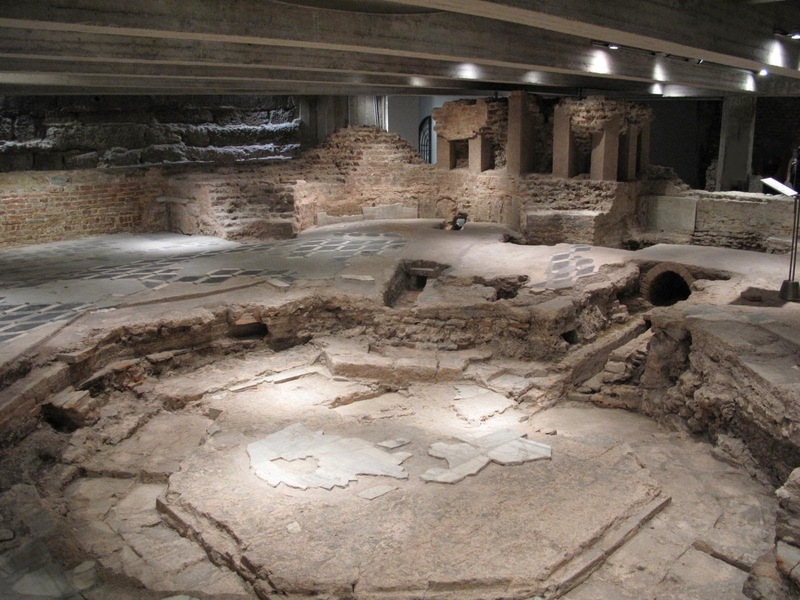 The remains of the Baptistery of Saint John at the Founts (San Giovanni alle Fonti), the paleo-Christian baptistery of Milan, discovered under the modern Duomo in 1889. In the second-oldest Roman lectionary, the Comes of Murbach, roughly a century later than the Wurzburg manuscript, the Nicodemus Gospel was added to a third Mass, that of the Finding of the Cross on May 3rd. The origin and gradual diffusion of this feast are not the subject of this article; suffice it to note two points. The Wurzburg lectionary has neither the Finding of the Cross nor the Exaltation, but both are in Murbach, and are well-established by the end of the Carolingian period. The latest possible date for Easter, (occurring only once per century since the Gregorian Calendar was promulgated in 1582), is April 25, making May 2nd the latest date for Low Sunday. It is probably not a coincidence that the Finding of the Cross was fixed to May 3rd, the first date at which it must occur in Easteride, but cannot fall within the Easter Octave itself. The Deposition of Christ, by Michelangelo, 1547-53, also known as the “Nicodemus Pietà” from the generally accepted tradition that the hooded figure at the top of the group is Nicodemus, and a self-portrait of the artist. From the Museo dell’Opera del Duomo di Firenze. It may also have been motivated by the fact that the Pascha annotinum was by this time falling into disuse; Bl. Ildephonse Schuster notes in The Sacramentary (vol. 2, p. 260) that it is only rarely mentioned in Rome after the 8th century. (The Murbach lectionary omits its Epistle.) This is probably due both to the disappearance of the adult catechumenate, and to the fact that it was supposed to be celebrated with the same rites as Easter itself, but will often occur in Lent; it would then have to be transferred, rather obviating the point of it. Assigning John 3, 1-16 to May 3rd may therefore have been intended to maintain its importance by finding it a more prominent position in the liturgy. And indeed, it is as the Gospel of the Finding of the Cross that it will serve as part of the liturgy of Eastertide past the Middle Ages and through the Tridentine period. Although the Octave of Pentecost is very ancient, Rome and the Papal court never kept the first Sunday after Pentecost as part of it. (This forms another parallel with Easter, since the liturgy of Low Sunday differs in many respects from that of Easter itself.) In northern Europe, as noted above, the Octave Day was a proper octave, repeating the Mass of the feast, but with different readings: Apocalypse 4, 1-10 as the Epistle, and John 3, 1-16 as the Gospel. Both of these traditions were slowly but steadily displaced by the feast of the Trinity, first kept at Liège in the early 10th century; but there was a divergence of customs here as well. When Pope John XXII (1316-34) ordered that Holy Trinity be celebrated throughout the Western Church, he placed it on the Sunday after Pentecost, a custom which became universal after Trent. But even as late as the beginning of the sixteenth century, the Low Countries and several major dioceses in Germany still kept the older Octave Day of Pentecost, and put the feast of the Trinity on the Monday after. Others compromised between the older custom and the new by keeping the readings from the Octave of Pentecost, but inserting them into the Mass of the Trinity; this was observed at Sarum, and by the medieval Dominicans and Premonstratensians. After the Tridentine reform, however, as part of the general tendency to Romanize liturgical books, this compromise was retained only by the Old Observance Carmelites, leaving the first part of the Nicodemus Gospel only on the Finding of the Cross for all the rest of the Roman Rite. In 1960, the feast was suppressed from the general Calendar, and relegated to the Missal’s appendix “for some places”, causing the effective disappearance of the crucial Gospel passage from the liturgy of Easteride. This defect been partially remedied in the Novus Ordo; the reading is broken into two pieces, assigned to the Monday and Tuesday after Low Sunday, but not to any major feast of the season. 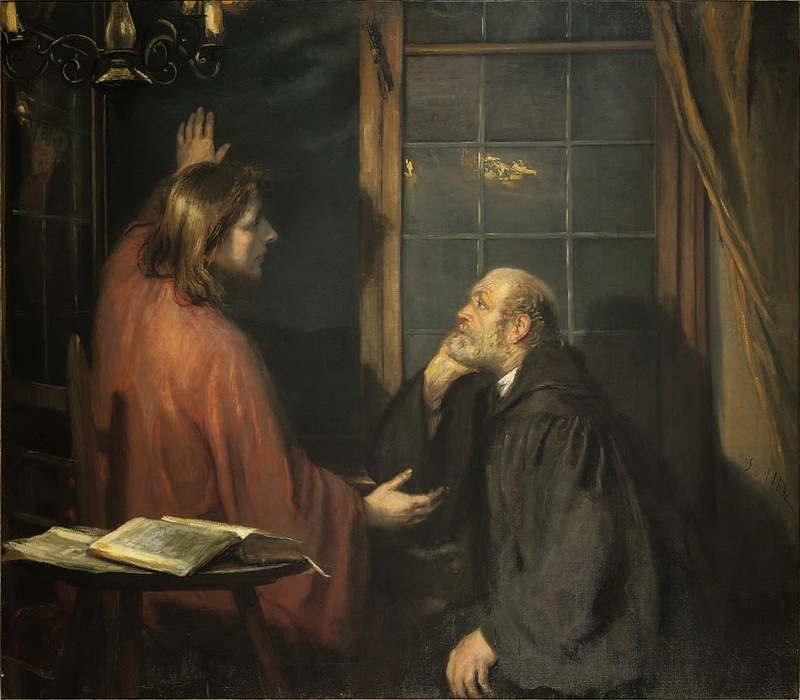 A second (and shorter) part of this article will consider the second part of the Gospel of Nicodemus, John 3, 16-21, on Pentecost Monday, May 25th.